The Blackbird Sisters Mysteries feature Nora, Libby and Emma Blackbird, three Philadelphia heiresses whose parents have run off with their trust funds, forcing all three women to get jobs for the first time in their lives. Nora Blackbird becomes the assistant to a newspaper society columnist and attends parties for a living. Unfortunately, Nora also stumbles over a lot of dead bodies while she's covering the social scene on the Main Line. Follow Nora's amateur sleuthing as she solves crimes of fashion as well as aristocratic murder! 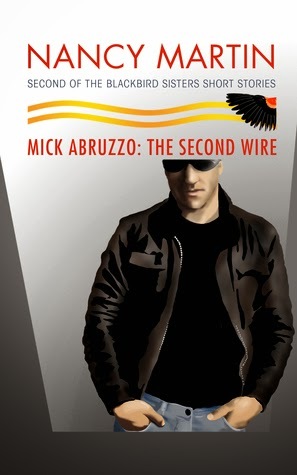 Nancy Martin's Mick Abruzzo: The Second Wire is great! I thoroughly enjoyed it. This short story / novella (72 pages) is #9½ in the Blackbird Sisters Mystery series. All of the works in this series are highly recommended — four or five kitties! — and are a pleasing mixture of cozy mystery and chick lit. I always look forward to the next book in the series, so I can find out what happens next to Nora, Libby, Emma and Mick — and if a mystery or two get solved along the way, that's just icing on the cake! Against his better judgment, Mick Abruzzo agreed to meet his idiot brother at a noisy South Philadelphia college hangout where Little Frankie swore they'd blend in. Idiot brother? Details — I wanted details! It is a nice change of pace to get Mick's thoughts and viewpoint on things, since his background is so different from Nora's. Some of this background is revealed in The Second Wire, so if you've ever wondered about what makes Mick tick (ooh, bad pun, sorry about that), here's your chance to find out. If you're like me and you want to read books of a series in order, be sure to read Mick Abruzzo: The Second Wire first (after reading Little Black Book of Murder, #9) and then read A Little Night Murder (#10 — release date August 5, 2014). By the way, author Nancy Martin has posted the first chapter of A Little Night Murder on her website — go check it out!